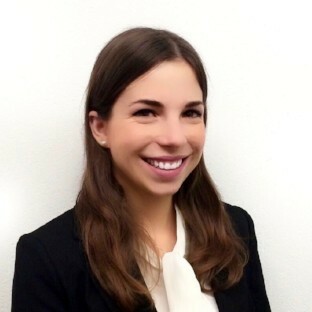 Elise Amez-Droz is a Program Associate at the Mercatus Center at George Mason University. Her work focuses on bringing market solutions to the health-care industry by bridging the gap between academia and public policy. She graduated in May from the Fuqua School of Business where she was an active member of the Adam Smith Society chapter. Please tell us a little about your personal and professional background. What about markets and economics drew you to organizations such as the Adam Smith Society and Mercatus Center? I grew up in Switzerland and always loved to talk about politics with my father. It wasn’t until I moved to the United States for my studies that I realized the extent to which socialist influences had an undermining effect on not just the economy but also society as a whole in Switzerland. A decisive shift in thinking happened for me when, for the duration of my degree at Duke, I was double-charged for health insurance because Duke and the Swiss constitution both required me to buy insurance from them. While Duke is a private entity, the Swiss government is not, and this was a wake-up call for me: I, as an individual, am much better suited than the government to make decisions that directly affect me, and I am ready to defend that freedom through my career choices. It all went forward from there—I started attending conferences on economic freedom, joined the Adam Smith Society, and eventually accepted a position at the Mercatus Center. Your current work focuses on health care—what current health care challenges and potential solutions interest you? The debate around health-care reform currently centers on costs, and while those are obviously too high ($10,000 per capita every year, far higher than in any other country), the conversation needs to shift to health-care outcomes. Overregulation surrounding what nurse practitioners, pharmacists, and other health-care providers are allowed to do drastically limits access to care (and, naturally, increases costs as well). Therefore, expanding providers’ scope of practice can significantly improve health outcomes across the country. Another important step would be to move away from employer-based health-care insurance, thereby freeing up resources for employees to have the freedom to choose the plan that works best for them. From a more high-level perspective, there needs to be a realization that, first, health care is a major expenditure account that requires planning and saving for throughout one’s life; and second, that people can and should shop around and demand products that meet their needs at prices that reflect the value they are getting from health-care industry actors. What was the highlight of your experience with the Adam Smith Society chapter at the Fuqua School of Business? I would be lying if I said that my highlight was anything other than the trek in Laguna Beach, but I’ll leave that for the next question! The second-best event I attended through Smith Soc while at Fuqua was our “Trump: 1 Year In” conference last December, in which professors and media personalities discussed the impact of Trump’s policy decisions during his first presidential year, addressing issues such as tax reform and healthcare policy. Not only was the event a success in terms of organization and content, but it was also a wonderful opportunity for our organization to break through the noise so that students across the board could hear a well-informed and intelligent debate about the impact of Trump’s presidency on businesses and individuals. You attended our trek on entrepreneurship in Laguna Beach this past winter. What was it like to spend a weekend immersed in texts and discussion with fellow Smith Soc colleagues? Very few experiences compare to a weekend in Southern California surrounded by smart, driven individuals discussing key topics about how to make society more prosperous and free! We used Socratic dialogue to unravel difficult questions related to opportunity in America, complacency versus economic growth, and destructive innovation (Schumpeter is our hero). What made that trek truly special was knowing that the people in the room had the skills, ambition, and passion necessary to make the solutions we developed come to life through their own entrepreneurial efforts. It has been a joy staying in touch with the participants and continuing to learn from them as I begin my career in the policy world and work to showcase the benefits of free enterprise for society as a whole.